Quest to corroborate great-grandmother’s connection to Essen’s Krupp steel dynasty. Tinton Falls, New Jersey resident and Krupp family author David Stroebel is appealing to a wider global audience for a DNA match that could conclusively link his great-grandmother, Engelbertha Krupp Stroebele, a former Jersey City, New Jersey resident at the turn of the 20th century, to Germany’s Krupp steel family of Essen. To date, there is no known, direct-family line of Krupp descendants living in the United States with the exception of the Stroebele family. In his 2010 book, The Cannon King’s Daughter Stroebel—with the help of three elderly relatives— wrote about his great-grandmother’s unrecorded banishment and disinheritance from the Essen Krupp works and known today as ThyssenKrupp AG. Engelbertha was banished and disinherited for disobeying her parent to break-off an engagement with John Joseph Stroebele, a poor shoemaker and bootblack employed at the Krupp estate. Following an eerily-similar fate met by many early 19th-century European female infants at the hands of their wealthy, male-seeking fathers, it is believed that because of this reason no baptismal record could be found for Engelbertha anywhere in Germany. Her very existence was brought into question by the Alfried Krupp von Bohlen und Halbach Foundation, located in Essen when questioned by Der Spiegel News Magazine in 2013. Despite controversial photographs of her that have surfaced with no reasonable explanation by the Alfried Krupp Foundation of who she was. Stroebel believed her 1874 banishment was kept a closely-guarded secret between family members and left undocumented. Stroebel is appealing for those world-wide who have already taken a DNA test and more importantly those who have not. He is appealing to those who may also have stories passed-down in their families of Krupp steel ancestors who lived in Germany. Autosomal DNA testing can be accomplished using the big four online companies— MyHeritage, LivingDNA, Ancestry and FamilyTreeDNA. Ideally, test results should be uploaded to GEDMatch.com, a free service where Stroebel has his DNA test results stored. GEDMatch offers a way for all commercial DNA tests to be compared all in one place. Bahr, Bastian, Baum, Bocking, Bohnsteadt, Eichhoff, Eisenhauer, Erlsberg, Erne, Farber, Forsthoff, Frenz, Friz, Hossenfeldt, Huyssen, Klocke, Krosen, Lobbert, Luedde, Moll, Perschbacher, Raitz, Rogers, Schemmann, Solling, Staub, Strobele, Stroebele, von Bohlen, von Clermont, von Devens, von der Gathen, von Ende, von Medinger, von Muller, Wilmowsky, Voss, Wilhelmi, Wickenberg, Wuppermann and Zopf. 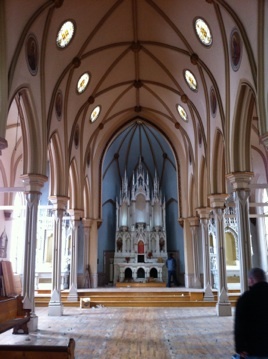 The interior of the now closed St. Boniface Catholic Church in Jersey City, New Jersey, were John and Engelbertha Stroebele worshipped and where their son, Carl Friedrich Stroebele, was baptized in 1884.